The siege continues, Thorin's obsession teeters into madness, and Bilbo plots treason. Well, at least it's treason to the King Under the Mountain, but let's be honest, Bilbo's been the de facto leader for some time now even if everyone pretends he isn't. Unfortunately pride and greed has gotten in the way of reason on both sides, with Laketown demanding a full twelfth of the treasure and nuking any chance of reasonable discussion. In many ways Bilbo has reached the apex of his growth into a hero, facing down not only what amounts to an entire army but risking expulsion from the company of his friends. In facing Smaug the worst aspect was the unknown, the moment in the dark where everything that could go wrong flashed through his mind. He's faced down his own fears and real monsters, but this is the first time he takes an action that actively betrays a friend's trust and desire no matter if he's acting in the over all best interests. His hero's journey isn't over, but his actions here, and taking responsibility for them next chapter, are huge acts of courage. "Whatever it is, it's my own, my good elves. But if you wish ever to get back to your own woods from this cold cheerless place," he answered shivering, " you will take me along quick to a fire, where I can dry - and then you will let me speak to your chiefs as quick as may be." Besides that we have yet another example of something the complete change in Bilbo's behavior, speaking with complete authority and confidence to unfriendly armed guards, what's important here is how he sways them. Not a promise of riches or a bloodless triumph, but a promise of home, a desire that's been haunting him this whole journey, even as he exalts in the adventure. Loyalty to their king aside, battle at the foot of a mountain is not what stirs the hearts of these elven guards. The Arkenstone is a thing of wonder, something that astounds man and elf alike. There's no way that such a gem could ever truly be divided as spoils, and I believe that Thorin would sacrifice all the gold in the mountain to possess it if he believed that was the only way. Bilbo is handing off a hostage for ransom and bargaining, not a piece of wealth. Too bad that Thorin is closer to madness than reason, so loss of life matters little to him. Biblo possesses an endearing optimism, for all that he regularly frets about lack of comforts and wanting to be home. He knows what he did will hurt Thorin greatly, even if it means saving countless lives. Yet when offered asylum, his choice is to return to the dwarfs, "I don't think I ought to leave my friends like this, after all we have gone through together." If anything, the dangers he's faced have allowed his optimism to grow as his courage grows. And the return of Gandalf, who is rightly quite pleased with his meddlesome little burglar, and warns of more "surprises" to come. Considering the wizard's sense of humor, Bilbo should probably take this as a signal to start worrying. This chapter is handled pretty concisely in the film. Imagine that. Thorin's long fallen into complete madness, and perhaps it can be argued that Bilbo is not so much committing an act of betrayal, but one of desperate (and optimistic) preservation. Some of the best dialog from the book was preserved in the film, but it has been moved around a bit so lines doesn't always appear where we expect it. 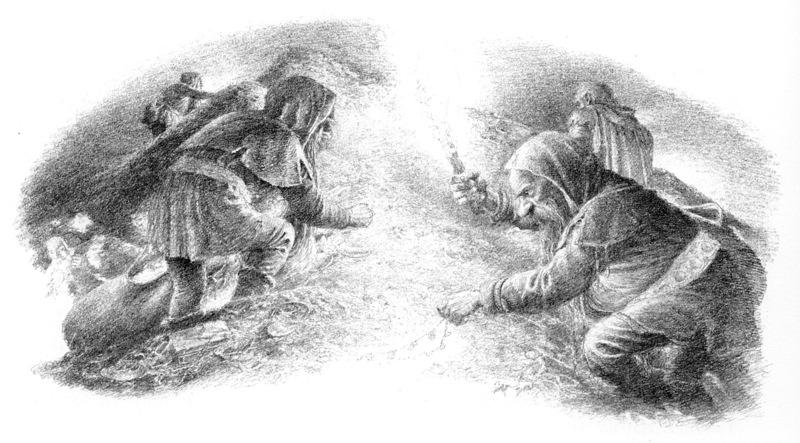 Bilbo's line about being an "honest burglar" we don't get until he's back with the dwarfs (next week's segment), and what was once expository text about the "evil of gold on which a dragon has long brooded" becomes a warning spoken by Gandalf. Other lines change speakers, such as who offers the hobbit sanctuary from the inevitable dwarven wrath. Overall, we lose some of Bilbo's sass, but it's replaced with some truly earnest exchanges here. I think one of the ways all of the additions hurt the film, is we're left having to sift through for the gems, and Bilbo has so many weighty lines throughout. Overall the high points stick in my mind, then I'm faced with reality as I sit down and re-watch and go "oh god, I forgot about all of this..." in between the snippets of fantastic. I'm not sure what they're doing with Gandalf here, besides making him uncharacteristically bad at understanding and manipulating people. I guess that assigning Alfred to keep an eye on Bilbo is purely a set-up for comedic failure, but Gandalf has a demonstrated skill at seeing into the hearts of men (and man-like analogs), which makes it highly unlikely he'd assign any duty to Alfred that involves anyone's well-being. In the books Gandalf indicates foreknowledge of the multiple approaching armies, but holds that knowledge close, knowing that orcish hordes will force an alliance between men, elves, and dwarfs. Instead in the film they show him pleading with Thranduil to take this threat seriously, which of course, he doesn't. Gandalf's wizardry is often more about knowledge and cunning than brute force magic, and we see none of that at all here. I mentioned last week that this is where I start liking Thranduil. Even when I'm confused as to why certain bits were put in the film, or that other character's actions don't make sense (see previous paragraph with my bit about Gandalf begging to be taken seriously), I'm sold on Thranduil's actions. High elves are known for their airs of importance, but Thranduil is portrayed as a paragon of vainglory. In the book the elf king is left largely undeveloped, a character more of reactions and desires than a fleshed out character. We know that he is suspicious, possesses a great desire for wealth, and can be assumed to view himself and elvenkind as a higher race. The characterization built out for him in the film makes sense and is consistently presented to us, even at the expense of Thranduil's capacity for empathy, as the battle of five armies looms.